Deliver desired RESULTS, through an INCREASE IN PRODUCTIVITY / SALES and REDUCTION OF COSTS. 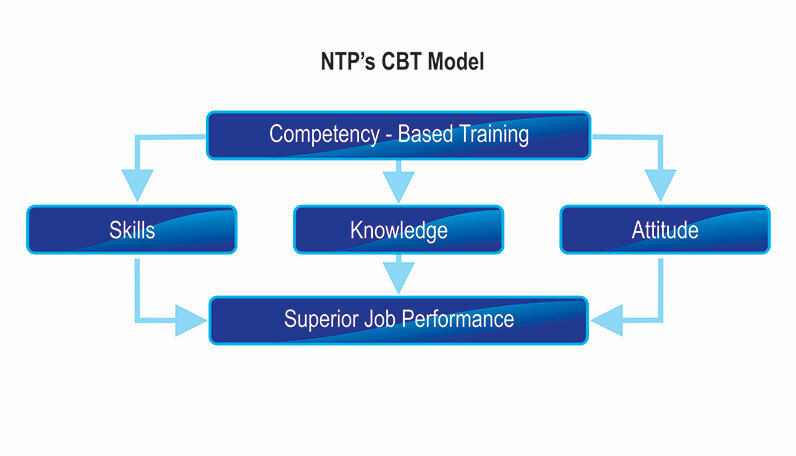 NTP World Forum has been introducing competency-based training (CBT) concept since year 2000. 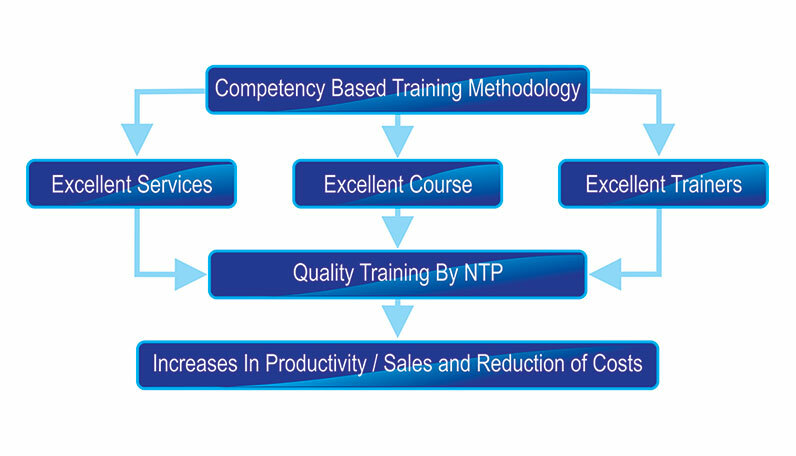 In year 2003, the competency-based training methodology was further enhanced and formalized in all of NTP’s training programs. This is to ensure that all our course participants acquire the necessary knowledge and skills to perform a particular work role to the standard required within industry. Competencies to be achieved are carefully identified, verified and made public in advance. Criteria to be used in assessing achievement and the conditions under which achievement will be assessed are explicitly stated. The instructional program provides for the individual development and evaluation of each of the competencies specified. Assessment of competency takes the participant’s knowledge and attitude into account but requires actual performance of the competency as the primary source of evidence. Participants progress through the instructional program at their own rate by demonstrating the attainment of the specified competencies. The approach to design competency standard needs to be strategically aligned with the business strategy, and linking competency systems directly to work outputs, customer requirements and performance goals. 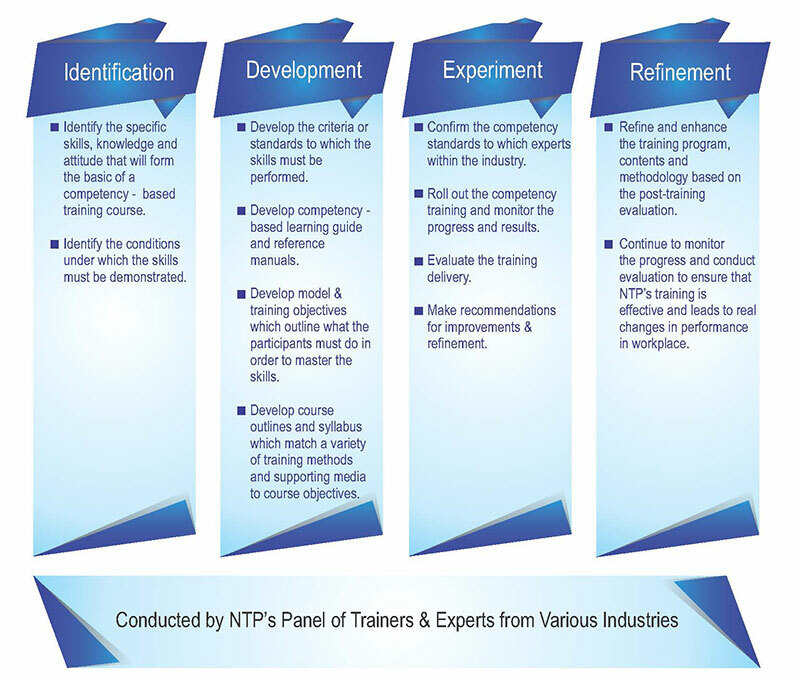 There are 4 key processes used by NTP World Forum when designing the competency-based training methodology. Identify the specific skills, knowledge and attitudes that will form the basis of a competency-based training course. Identify the conditions under which the skills must be demonstrated. 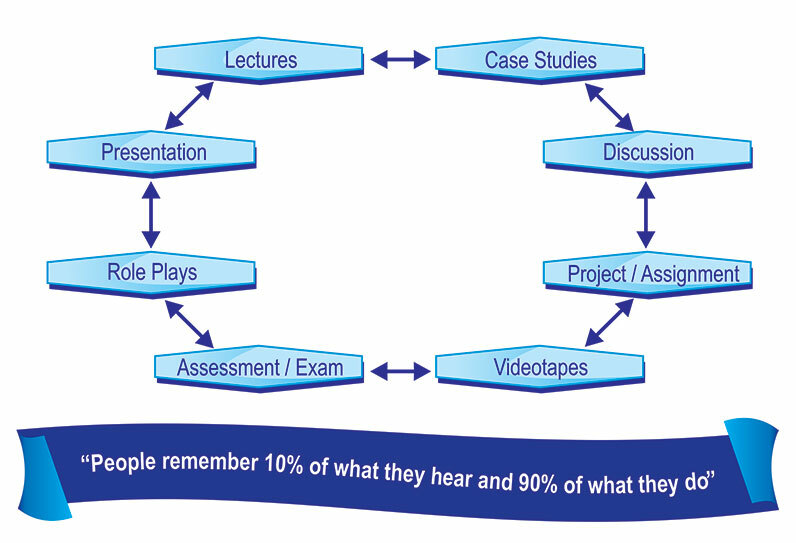 Develop the criteria or standards to which the skills must be performed. Develop competency-based learning guides and reference manuals. Develop model & training objectives which outline what the participant must do in order to master the skills. Develop course outlines and syllabus which match a variety of training methods and supporting media to course objectives. Confirm the competency standard with experts within the industry. Roll out the competency training and monitor the progress and results. Make recommendations for improvements & refinement. Refine and enhance the training program, contents and methodology based on the post-training evaluation. Continue to monitor the progress and conduct evaluation to ensure that NTP’s training is effective and leads to real changes in performance in workplace. NTP World Forum has been adopting CBT approach to maximize the job performance and to realize the client’s corporate vision through the people. Administration of a pre-course questionnaire to assess the participants’ knowledge and attitudes about course content. This assessment is to ensure participants possess the entry level skills to complete the course successfully as well as determine the level of their skills. Delivery of the course by a trainer / facilitator using an interactive and participatory approach. Transfer of skills from the trainers to the participants through mentoring and counseling skill demonstrations using slide sets, videotapes, models and role plays. Development of the participants’ skills using a humanistic approach, which means participants acquire the skills and then practice until competent using different models and role plays. Practice of the skills following the steps in the learning guide until the participant becomes competent at performing the skillful. Evaluation of each participant’s performance is done by the trainers using competency-based checklists. Presentation of a statement of qualification that identifies the specific service the individual is qualified to provide. NTP’s training methodology maximizes the application of the hands-on workshop content. Sessions include practice exercises, discussions to relate exercises to real situations, structured work between workshops and participants’ progress reports of their own organization building activities.